A VERY classic from Eric Carle, creator of The Very Hungry Caterpillar! One day a tiny cricket is born and meets a big cricket who chirps his welcome. The tiny cricket tries to respond, but there is no sound. The quiet cricket then makes his way into the world, meeting one insect after another, each of whom greets the little cricket with a cheery hello--the hum of a bee, the whirr of a dragonfly, the whisper of a praying mantis. The cricket rubs his wings together each time, but nothing happens, not a sound. Until the day he meets another cricket, a female, and something different happens . . .
As children turn the page on this wonderful moment, they are greeted with a surprise--an actual chirp! 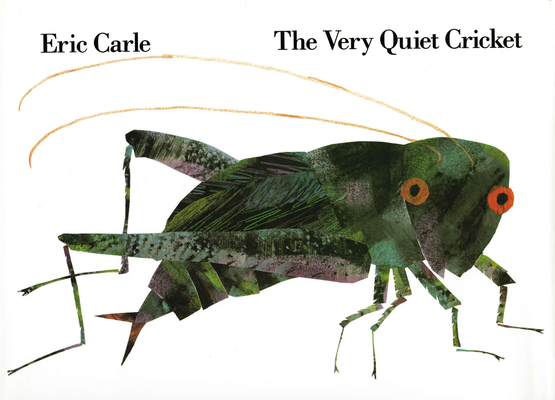 Full of Eric Carle's gorgeous and lush collage art, a gentle rhythmic text for read-alouds, and a wonder-inducing surprise at the end, The Very Quiet Cricket remains an all-time favorite from one of the true masters of picture-book making. Batteries are replaceable. Please use two 1.5 volt L1131 button cell batteries.